Notices to Mariners (NTMs) provide advice on general navigation and safety issues. Further Notice: No further Notice will be issued. Details: Mariners are advised of diving operations being undertaken south of Golden Beach within 3NM from the coast, at location 38.15.432177' S to 147. 25.307525' E (see attached map). There will be a red unlit surface buoy situated at the centre of the dive site location. The area covered will be approximately 2NM east and 2NM west of this location. Mariners are advised to navigate with caution in the vicinity of the buoy and the vessel ‘SECA’ MSV 11730 (call sign “SECA”) which will be displaying code flag “A” (blue and white dive flag) and day shape “restricted in ability to manoeuvre”. Mariners should keep a minimum distance of 100 m from vessel “SECA” and slow to a speed of 5 knots when passing, mariners should also keep a listening watch to VHF Channel 16. The diving operations will commence on Saturday 6 April 2019 and continue for approximately six days. Further Notice: This Notice expires 12 April 2019. No further Notice will be issued. Further Information: For further information contact Sarn Eckhardt, Master “SECA”: lakescharters@gmail.com or 0409 439 699. Mariners are advised that due to high water levels within Sydenham Inlet, Parks Victoria shall be attempting to open the inlet entrance to the sea on Thursday 28 March 2019. An exclusion zone will be established within Sydenham Inlet to facilitate the safe opening of the inlet to the sea. Waters of Sydenham Inlet Channel south of a line from a point on the western shore 37° 46.371’ S, 149° 0.040’ E (WGS84) to a point on the eastern shore 37° 46.374’ S, 149° 0.153’ E (WGS84), as marked by red buoys, to the seaward entrance. The exclusion zone will be in effect from 9.00 am on Thursday 28 March 2019 to 12.00 pm on Thursday 4 April 2019. 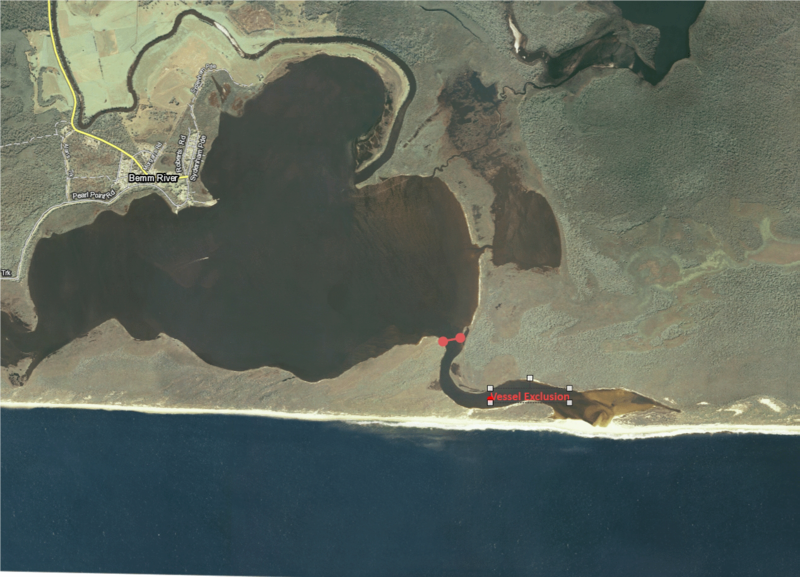 Mariners are further advised to stay clear of the exclusion zone and not to attempt to transit the lower reaches of the Inlet near the newly created opening. Further Notice: This notice expires at 12.00 pm on Thursday 4 April 2019. No further Notice will be issued. Further Information: For further information contact Parks Victoria Ranger on 0408 368 164. Mariners are advised of works being undertaken by Cooper Energy involving repair works to the Sole pipeline on a transit line between the Sole wellhead location in Commonwealth waters and the end of the previously installed nearshore pipeline in Victorian State waters in the Gippsland Basin (a few hundred meters off the coast of the existing Orbost Gas Plant at Newmerella). 38° 6' 00.00'' S, 149° 00' 31.00'' E (the Sole wells). Mariners are advised to avoid navigating along the transit line and within the vicinity of the vessel ‘Seven Eagle’ until all installation activities are completed. Mariners should maintain a listening watch on VHF Channel 16. For further information regarding the activity please contact Liz Sully, Project HSEC Lead, Cooper Energy, on 0411 018 024 or (WA) 08 6556 2102. Further notice: This notice expires on 31 May 2019. No further Notice will be issued. Details: Mariners are advised of bathymetric and geophysical survey operations being undertaken by Furgo Australia Marine for approximately two months from 9 March to 15 May 2019, in Bass Strait off of McGauran Beach extending south into Commonwealth waters (see attached map and survey area coordinates). The vessel ‘MV Silver Star’ undertaking this work will be limited in its ability to manoeuvre and will be towing survey equipment up to 300 metres behind the stern. It is advised that all other vessels keep a minimum distance of 500 metres clear of the vessel. Operations will be conducted on a 24-hour basis. MV Silver Star (call sign VJD3650) will be displaying appropriate day shapes and India over Romeo (I/R) flags. Mariners should maintain a listening watch on VHF channel 16. Further Notice: This Notice expires 15 May 2019. No further notice will be issued. Decommission of Wave Power Generator and exclusion zone. Notice to Mariners No. 199, 217 and 231 (Temporary) of 2015 are referred and cancelled. Mariners are advised of the establishment of a vessel exclusion zone approximately 6km west of Port Fairy in the vicinity of Taylors Bay for the purposes of the works activity proposed by Shelf Subsea Australia Pty Ltd for diving works associated with the decommissioning of the BioWave generator site. Exclusion Zone - All vessels and persons are prohibited from entering or remaining within a circular area extending 150 metres from a centre point 38°23.905’ S; 142° 10.36’ E defined by a North Cardinal Buoy 38° 23.824’ S, 142° 10.360’ E and a South Cardinal Buoy 38° 23.986’ S, 142° 10.360’ E, excluding persons and vessels authorised and/or engaged in works. The exclusion zone will be in place for the duration of the works from 1 March to 30 April 2019. Diving vessels associated with the works will display Flag ‘alpha’ when diving operations are underway. At the completion of the works the North Cardinal Buoy and South Cardinal Buoy will be removed. Further Information: For further information contact Stuart Weymouth, Shelf Subsea Australia Pty Ltd, on telephone 08 9329 5000 or email sweymouth@shelfsubsea.com. Further Notice: This Notice is self-cancelling. No further Notice will be issued. 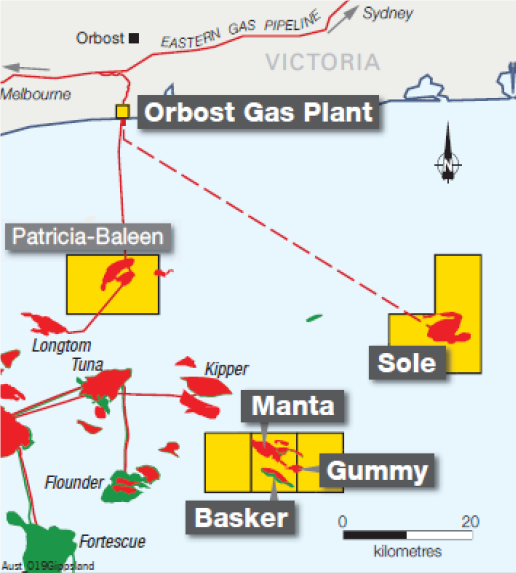 Details: Mariners are advised of works being undertaken by Cooper Energy involving umbilical installation activities on a transit line between the Sole wellhead location in Commonwealth waters and the end of the previously installed nearshore pipeline in Victorian State waters in the Gippsland Basin (a few hundred meters off the coast of the existing Orbost Gas Plant at Newmerella). Please see below map showing approximate location of the activity. Mariners are advised to avoid navigating along the transit line and within the vicinity of the vessel ‘Skandi Acergy’ until all installation activities are completed. For further information regarding the activity please contact Liz Sully, Project HSEC Lead, Cooper Energy, on telephone 0411 018 024 or (WA) 08 6556 2102. Further notice: This notice expires on 31 March 2019. No further Notice will be issued. 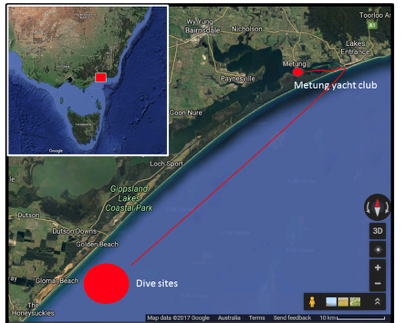 Details: Mariners are advised of five special buoys established in the approximate positions (below) of an offshore recreational fishing reef, approximately two nautical miles east-south-east of Torquay. All five buoys will be withdrawn in May 2019. Special mark buoy solar marine lantern – 800mm diameter, 1.26m high, 2-3M. AUS Charts and Publications Affected: Aus. 143, 788. Victorian Charts and publications affected: Nil. Further Notice: A further Notice will be issued. Local port managers who must, so far as is reasonably practicable, ensure the safety of marine safety infrastructure operations carried out by the local port manager or supplied to that manager. Section 224 of the Marine Safety Act 2010 (Vic). Persons who are responsible for managing boating activity events (event managers) under Section 25 of the Marine Safety Act 2010 (Vic). (b) if it is not reasonably practicable to eliminate risks to safety, to reduce those risks so far as is reasonably practicable. Maritime Safety Victoria is developing a Code of Practice to assist local port managers and event managers to understand and comply with the new safety duty. If you have any questions, please email waterways@transportsafety.vic.gov.au. 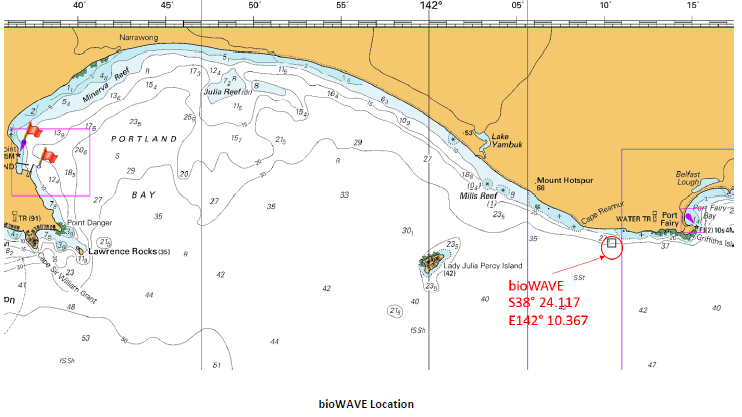 Details: Mariners are advised of a Wave Rider buoy established in position: 38°22.920’S, 142°17.365’E (WGS84). 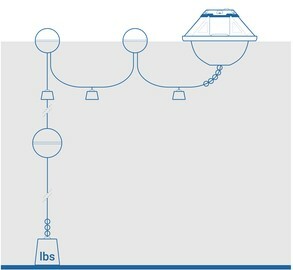 The yellow buoy measures 42 cm in width and is attached to two (2) orange floats, then anchored at a depth of 28 metres. It will display an amber light with characteristic: Fl.Am.2.5s. The Wave Rider buoy is measuring swell heights as part of a project undertaken by Deakin University and is expected to remain in place until 14 March 2019. Mariners are advised to keep clear of the area. AUS Charts and Publications Affected: Aus. 141 and 349. Further Information: Photo and diagram below. The light be shall reinstated as soon as possible. Mariners are advised to navigate with extreme caution in the vicinity of Shoal Inlet entrance during the hours of darkness. A further Notice will be issued. 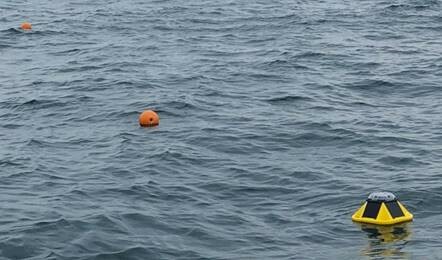 The buoy shall be re-positioned as soon as practicable. Mariners are advised to navigate with caution in the vicinity of the Orungal wreck. DATE: 24 December 2015. Effective immediately. Mariners are advised that the definition of Port Phillip Heads has been amended. 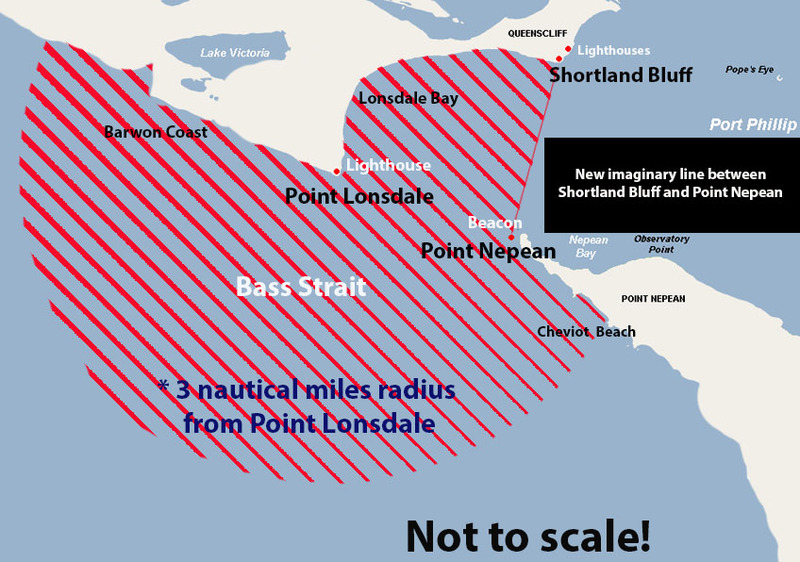 Port Phillip Heads means all the waters between an imaginary line drawn between Shortland Bluff and Point Nepean, and the seaward limits of an imaginary line constituting the arc of a circle with a radius of 3 nautical miles centred on Point Lonsdale; (Regulation 4(a) of the Marine Safety Regulations 2012 (Vic)). Port Phillip Heads is a designated hazardous area as detailed in Regulation 4(a) of the Marine Safety Regulations 2012 (Vic). Regulation 101.4 Marine Safety Regulations 2012 (Vic) requires that all persons in the open area of a recreational vessel or hire and drive vessel must wear a PFD when "the vessel is crossing or attempting to cross an ocean bar or operating within a designated hazardous area". DATE: 18 November 2015 - 30 June 2017. Effective immediately. A further advice will be issued at the completion of the works activity. 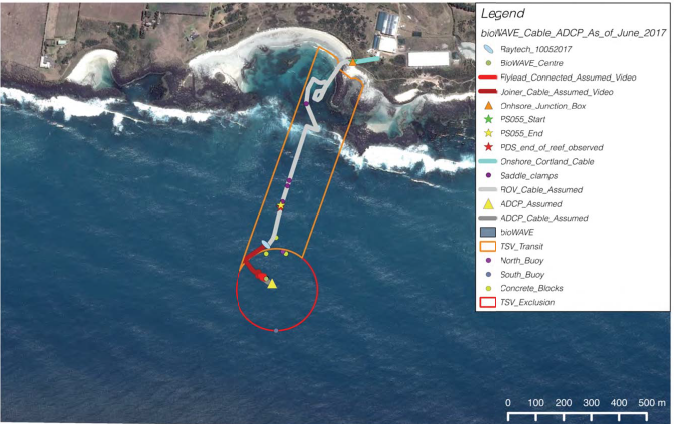 Mariners are advised of the establishment of a vessel exclusion zone and transit lane established approximately 6km west of Port Fairy in the vicinity of Taylors Bay for the purposes of the works activity proposed by Biopower Systems Pty Ltd for the installation and operation of a wave power generator. Under section 211(1) (b) (i) of the Marine Safety Act 2010 (Vic) the following rules apply to the navigation and movement of vessels and persons. All vessels and persons are prohibited from entering or remaining within a circular area extending 150 metres from a centre point 38°23.905' S; 142° 10.36' E defined by a North Cardinal Buoy 38° 23.824' S; 142° 10.360' E and a South Cardinal Buoy 38° 23.986' S; 142° 10.360' E, excluding persons and vessels authorised and/or engaged in works. The operator, master or person in charge of a vessel must not use the Transit Lane other than for transiting of the vessel and must not permit the vessel to be anchored in or allow the vessel to drift in the Transit Lane. Fishing, netting, casting of lines or trawling is prohibited within the transit lane unless authorised. The Transit Lane extends 100 metres easterly and westerly of a line indicated by a beacon on the shore 38° 23.391' S; 142° 10.547 E and a North Cardinal Buoy 38° 23.824' S; 142° 10.360'. The transit lane is bounded by the points detailed in the table below. Mariners are advised that two temporary cardinal mark buoys will be established approximately 6km west of Port Fairy in the vicinity of Taylors Bay. The buoys are expected to remain in position until June 2017. Under section 211(1) (b) (i) of the Marine Safety Act 2010 (Vic) persons and the navigation and other movement of vessels within 100 metres of any vessel detailed in Table 1 is prohibited, excluding persons and vessels involved in the deployment of two cardinal mark buoys. Mariners are advised that the Griffith Island Light is currently unreliable and operating on reduced power. Mariners are warned to exercise extreme care when navigating in the area.